Our no-risk pre-opening memberships at Hollywood.fit feature group workouts that are happening NOW at no additional charge. But if you can’t wait for those workouts or the studio to open – you want more classes, personal inspiration or instruction, or times at your convenience, we’ve got you covered. This is a limited time offer and may expire at any time. So sign up now! Muay Thai shorts are in! The latest batch of Muay Thai shorts are in, straight from Thailand. Pick up a pair at the store at our new location at Texas Karate Institute, 1974 Nantucket Dr. (South of W. Campbell Rd. ), Richardson, TX 75080. 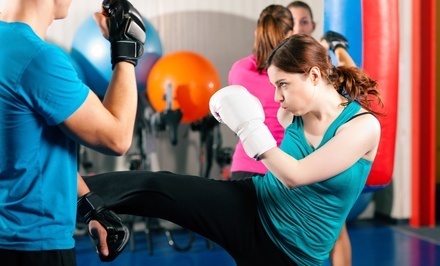 Haven’t tried Jay’s Kickboxing at the Shops at Willow Bend, Plano location yet? Then today is YOUR day. Sure, you can come in and try a class. But you won’t get the full experience and see results unless you give us a few weeks. So we’re going to give you – and a friend or family member – the best kickboxing and Muay Thai in DFW at up to 85% off with unlimited classes for an entire month. It’s just $25 for one person and $45 for two with our new Groupon. Come in and join us! Train, get fit, and have fun! We’ll help you with whatever your fitness goal you have. Get in shape … improve your fitness … tone your muscles … supercharge your cardio … lose weight … learn self-defense … build confidence and discipline … or hone your martial arts skills and techniques … all at Jay’s! Jay now teaches at Willow Bend Martial Arts in Plano, located on the 2nd floor of The Shops of Willow Bend next to Macy’s. Jay’s students can now sign up for 50% off for just $74.50 per month at the studio. But hurry as this limited offer expires soon! Get the details and links at JaysKickboxing.com. Effective immediately, Jay will no longer be at any Title Boxing Club locations. Have you seen Jay at Title Boxing Club yet? If you haven’t, then we’ve got a deal for you. Get the best darn instructor in DFW – Jay “Hollywood” Wilson – at a great club – Title Boxing Club – with our special deal. Get fit, gain strength, lose weight, and kill stress! Get started with this high-energy, intense, and fun workout routine. All classes consist of 15 minutes of cardio/warm-up exercises, 30 minutes of heavy bag work, and 15 minutes of abs/core exercises and will have you looking and feeling great before you know it. Check it out on Living Social before it expires in 6 days. Be sure to sign up for Title at Allen or McKinney where Jay teaches. If you have seen Jay and are already a member, invite your friends and forward this email or share this link with them. It’s more fun kickboxing with a friend! Have you tried a class from world champion kickboxer Jay “Hollywood” Wilson at Title Boxing Club in Allen yet? If not, we’re going to make it easy to get a taste … or a full drink … of Jay’s Kickboxing. 1. A TASTE. It’s always free to try one of his (or other Title) classes. 2. A SIP. Try this Groupon for $15 for two weeks of classes. Good at any of 11 Title DFW locations. 3. A DRINK. Regular pricing at Title is just $69 per month, much less than you’ll find at typical martial arts and fitness studios. Visit JaysKickboxing.com for classes, locations, schedules, and more information. Please note that the schedule has been changed since our last notice. In particular he now teaches Kickboxing Mon/Wed/Fri @ 6pm in Allen. Jay’s Kickboxing is moving to a new Title Boxing Club in Allen. There will be no more classes at Revelation Dance Studio or Star Jiu Jitsu. However Jay is continuing to teach his classes at Title in McKinney. The Title Allen opening is now targeted for Wednesday. So the bad news is you’ll have to wait a few days until Title Allen opens to enjoy your next class from Jay. During this timeout do some cross-training and try yoga, weightlifting, running, or biking. The good news – we have an unbeatable Pre-Opening special that saves you over $100! Visit Title Boxing Club McKinney (see location info below). Say you’re from Jay’s Kickboxing and want the Title Allen pre-opening special. The first and last month’s payments required on signup will be waived. Pay only the enrollment fee of $99. Your first month will be free. Then pay only $59 per month. Hurry as this deal is only valid before Title Allen opens.